The Rim Joist (or Band Joist) is a board that caps off the floor joists and forms the outer box of the floor assembly. It is extremely important to both air seal and insulate this area to prevent both wasted energy and costly moisture problems. Moisture problems typically occur when warm moist air leaking from inside the house comes in contact with the colder surface of the exterior wall boards. During cooler outdoor temperatures, this moisture can condense into water and will eventually lead to rot or mold. Fortunately there is a fairly simple solution to addressing this area and avoiding any future problems. Closed cell spray foam has several benefits over fiberglass, cellulose and other standard insulation materials. The single most important benefit is its air sealing capabilities. Fiberglass insulation does little to stop air leakage; it merely filters the air as it passes through. Other benefits of foam include: higher R-Value per inch, ability to conform to non-standard sizes and spaces, and it is generally easier and faster to install. 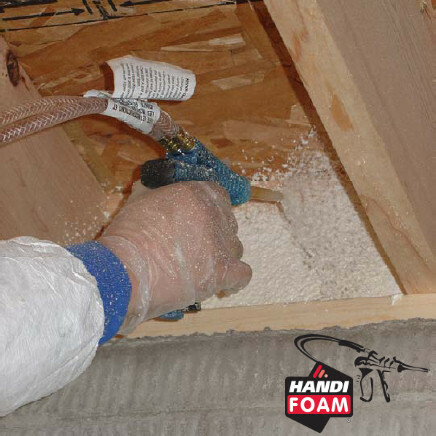 Using our Handi-Foam, closed cell spray product to seal and insulate rim joists, has several advantages over other methods. It is much more effective at creating a good quality air seal, saving energy and leading to a more healthy home. 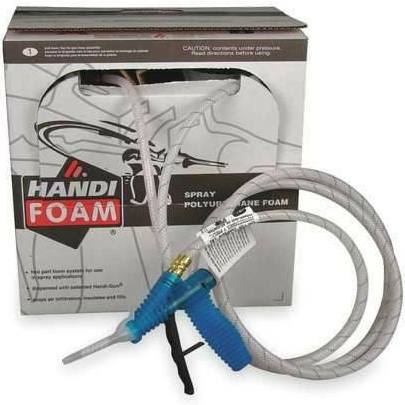 Although the material costs are higher, when you factor in the time/labor costs of conventional methods, the overall cost of using spray foam is typically less. 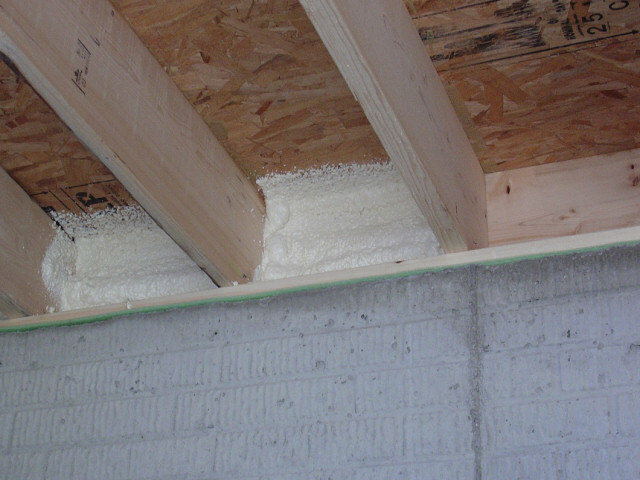 Learn more about the savings of using band joist insulation spray foam in this Case Study. You may also want to consider the hybrid method which combines a layer of foam with conventional fiberglass insulation to achieve an extremely effective and air tight insulation system at a relatively low cost.